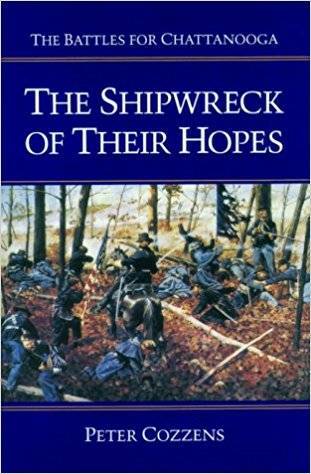 Peter Cozzens, "The Shipwreck of Their Hopes: The Battles for Chattanooga"
Civil War enthusiasts will welcome this concluding volume of Peter Cozzens's highly praised trilogy on the Civil War in the West. The battles around Chattanooga in the late fall of 1863 were among the most decisive of the Civil War, opening the Deep South to the Union and setting the stage for the Atlanta campaign and the March to the Sea. 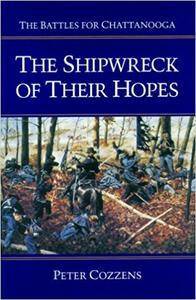 After Chattanooga, the principal Confederate army in the West fought without spirit or hope of victory. Cozzens's comprehensive account details movements of individual regiments, even as it reveals the larger impact of the campaign on the outcome of the war. In The Shipwreck of Their Hopes, Cozzens draws on his acclaimed storytelling skills and exhaustive research efforts to fully chronicle one of the South's most humiliating defeats. As in his earlier books, he brings to life the officers and enlisted men who fought the war.